Agave To Go was created for quick food in Corolla NC. Call ahead or stop by to pick up takeout tacos, enchiladas, fajitas and appetizers. Since our Corolla full-service restaurant, Agave Roja, only serves tacos for lunch, Agave To Go is the place to get our tacos for dinner. Take a bunch home to your family and friends or pack up a picnic for the beach. 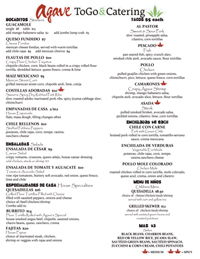 Please click thumbnail below to view the Agave To Go Menu. Note: Off-season hours vary. Please call for seasonal hours.